Societies are often judged by the arts and culture they bring to the world. Austria’s Vienna Philharmonic is one of the most respected musical ensembles in the world, and serves as a source of national pride for Austrian people. 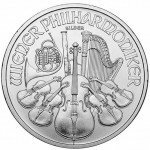 The Austrian Mint celebrates the orchestra’s place in national history by featuring on the country’s official silver bullion coin. 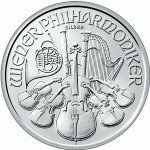 Today you can purchase a 2015 1 oz Silver Austrian Philharmonic Coin from Silver.com with an MS70 grade from the Numismatic Guaranty Corporation. These coins are part of the Early Release series, meaning they arrived at from the Austrian Mint within the first 30 days of their release. 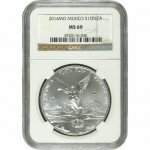 An MS70 grade from the NGC indicates these coins have a perfect mint and no blemishes. The Vienna Philharmonic is one of the world’s oldest orchestras, having formed in 1842. The orchestra performs regularly at the Musikverein Golden Hall in the national capital of Vienna. The Austrian Mint’s chief engraver, Thomas Pesendorfer, designed the imagery used on each side of the Silver Austrian Philharmonic coin. The imagery on the coins is shared with the Gold Austrian Philharmonic coins, but the silver version was introduced in 2008, much later than its gold counterpart. On the obverse side of the 2015 1 oz Silver Austrian Philharmonic coin is the pipe organ found inside the Musikverein concert hall in Vienna’s Innere Stadt neighborhood. Engravings on this side of the coin are in German, and read “Republik Osterreich,” the face value (in Euros), metal content, purity, and weight of the coin. The Austrian Mint is a subsidiary of the National Bank of Austria, but has a history that dates back to 1194. Duke Leopold VI of Austria founded the mint with 15 tonnes of silver paid to him by Richard the Lionheart as a ransom for passage out of Austria during his army’s march home from the Crusades. 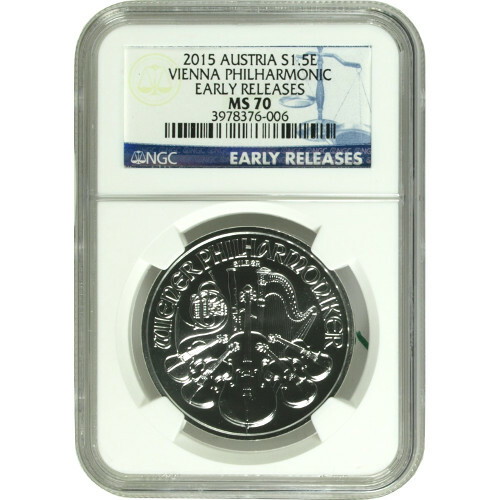 If you have any questions about this Early Release 2015 1 oz Silver Austrian Philharmonic Coin NGC MS70, don’t hesitate to contact our associates at 888-989-7223. You can also reach us online using the live chat located on our contact page.